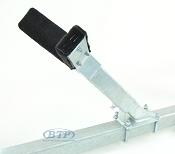 This Bow V Guide Support is seen mounted to a cross beam towards the front of your trailer. Its intention is to catch the bow of the boat, support it, and guide it to the Bow stop. It will mount to the cross member with a 2" Hat Bracket and (2) Square U-Bolts. 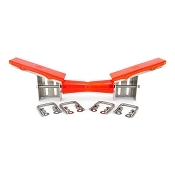 Most commonly the cross member will be a 3" x 3" Square tubing, as this is an industry standard on trailers that would use this device. 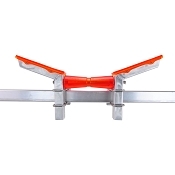 It features a heavy duty polymer to protect the bow and keel of the boat from damage. 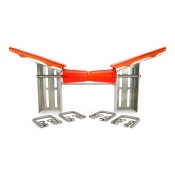 We also have an individual replacement center section for a different style V-Guide for easy replacement.